Lincoln's Kyle Deuel lines up to hit a single Saturday to lead off the top of the fifth against Gabriel Richard at Oestrike Stadium. He finished 2-for-3 with two singles. May. 10, 2009 · 12:30 p.m. The nightcap of the Lincoln-Richard Tournament on Saturday proved to be the championship game between the two host schools. Ypsilanti Lincoln and Ann Arbor Gabriel Richard entered the final game at Eastern Michigan University’s Oestrike Stadium each 2-0 in the four-team tournament, which also included Ypsilanti and Belleville. Lincoln and Richard didn’t disappoint either. The game came down to the final pitch, with Richard taking a 3-2 win courtesy of a wild pitch in the bottom of the seventh. Prior to the last inning, Lincoln pitcher Andrew Dillon had been able to get himself out of various jams throughout the game. However, he wasn’t able to do so in the seventh. Dillon allowed a leadoff single and then back-to-back walks before throwing a wild pitch that allowed Donnie Eaton to score the winning run. Half of the tournament games were played at Oestrike and the other half was at Lincoln’s home field, where Lincoln beat Belleville 13-2 and Ypsilanti 8-2. The game between Lincoln and Ypsilanti was the last for Lincoln’s seniors on their home field. Senior Victor Roache made the best of it as he went 4-for-4 with four RBIs, two runs, a stolen base and a home run to left field. Lincoln scored five in the thrid to take a 5-2 lead and never trailed again. Roache’s home run extended his team’s lead to 6-2 after four innings. 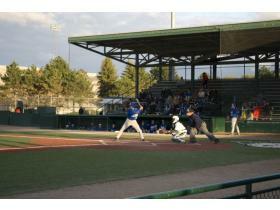 Ypsilanti (1-15) had a chance to tie the score in the fifth when it loaded the bases with no outs. That opportunity was quickly squandered when Ypsilanti, which left nine runners on base, tried a squeeze bunt that turned into a double play. Lozano and Bigham each found positives from the tournament, though. Lozano said it was good to play both Ypsilanti and Belleville because his team will be in the same division as Ypsilanti next season and plays Belleville in districts.